BERSIH 4.0 supporters are eager to bring change to country and they are doing what they can to show solitude and support for the whole movement. While many will be dressed in yellow and actually participating in the rally, those who are unable to make it to the rally are contributing through other means. 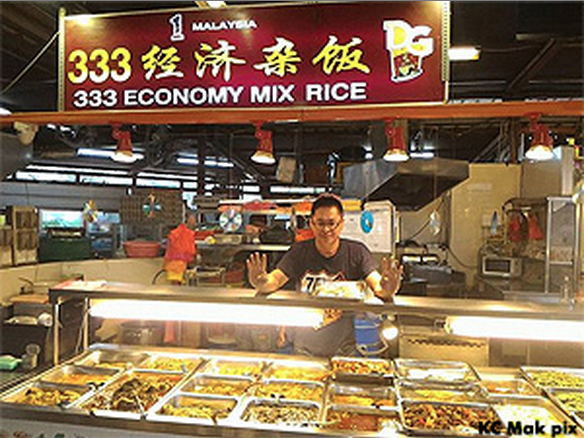 In fact, one generous stall owner, Liu Zhi Qiang will be operating his food stall “333 Economy Rice” at the DG Food Court in Taman Wawasan, near Puchong between noon and 2pm and he will be giving away 300 packs of economy rice for free as his way of supporting the movement. Supporters that will be participating in the rally can drop by the food stall in yellow T-shirts and the first 300 people will be served for free on a first-come-first-serve basis. The 300 packs of meals will be served within the two-hour period, or until he’s out of stock. He also expressed regret that the food at this stall is non-halal and that he won’t be able to provide for BERSIH supporters who are Muslim. However, he does reiterate his belief that the support for BERSIH should be multi-cultural and multi-racial. 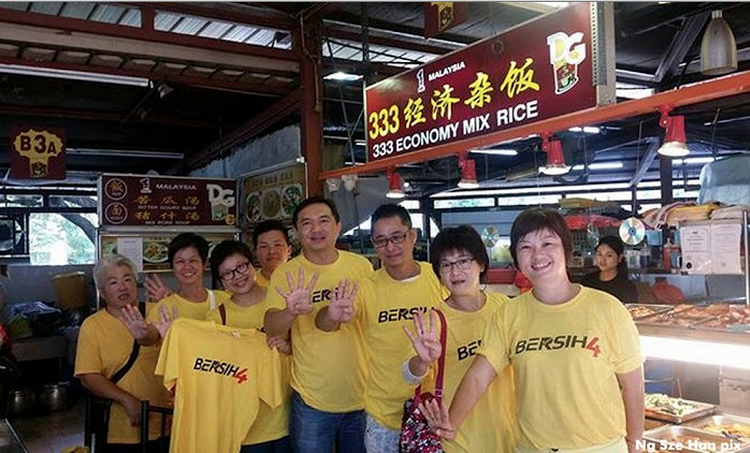 Malaysiakini reported that he said, “Participants may pick any dish they want, as long as they fill their stomachs and have the energy to join the rally.” They also added that he was inspired to offer the free lunches after he saw Kinrara assemblyperson Ng Sze Han and his team selling BERSIH T-shirts at the food court. Mr. Liu wanted to join the rally himself but he couldn’t do so as he had to keep his stall open for business. Despite the circumstances, he felt that he could make some sort of contribution towards the movement and he feels people shouldn’t interpret his actions as a publicity stunt. He hopes and wishes that the rally would be of success so that it could change the status quo of the nation. It’s a common belief that change is required within the nation so that the nation can progress economically and politically. During the economic downturn along with the implementation of the GST and the rise of doing business in Malaysia, small businessmen like himself have been gravely affected. He estimates that if each person eats RM6 worth of food, it would cost about RM1800 to provide the free meals, which is a lump sum amount. 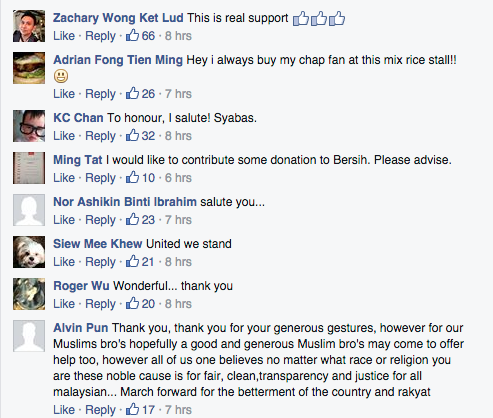 Given the nature of his benevolence and support, netizens have reacted kindly towards his gesture (well, mostly). 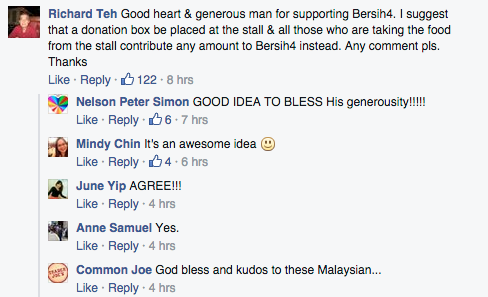 A netizen wanted to help the shop keeper through donations. While others appreciated his support. One felt he should have made it free for all supporters. Non-halal food was bound to be disappointing but this netizen appreciates his heart more than anything. 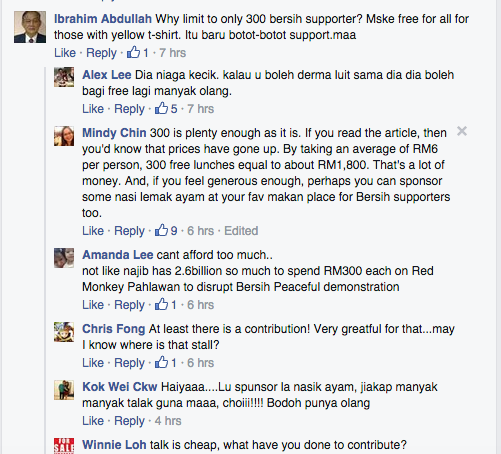 You can also check out the other responses on MalaysiaKini’s Facebook Page.